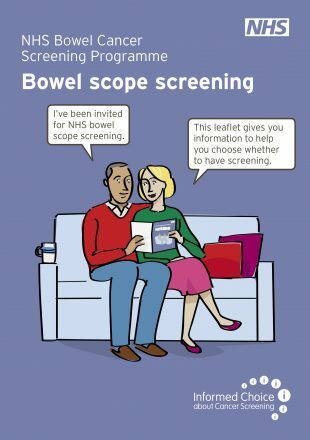 Screening to reduce or prevent bowel cancer requires expert endoscopists who look into the bowel and find cancers or signs that a patch of bowel (a polyp or adenoma) might develop into cancer. This is a task that requires skills and experience. Finding enough polyps/adenomas that might develop into cancer is very important. This is referred to as the adenoma detection rate (ADR). The NHS Bowel Cancer Screening Programme (BCSP) measures each clinician’s ADR performance and supports them if they are struggling. The programme has set an ADR minimum standard of 6.8%, with a target of 10%, using research from pilot studies. Findings from these studies suggest that endoscopists get better at detecting adenomas as they perform more procedures, but it also suggests that once they achieve a certain level they do not improve. In some cases this level was below the minimum standard of 6.8%. The Screening Quality Assurance Service (SQAS) has been working with screening centres to support endoscopists who are not reaching the minimum standard so that they find more adenomas and increase their ADR. The graphic below shows the improvement seen in 14 endoscopists who were below the minimum standard of 6.8% in January 2016. Following action plans and interventions, most endoscopists performed above the minimum ADR standard, with many performing above the national average. 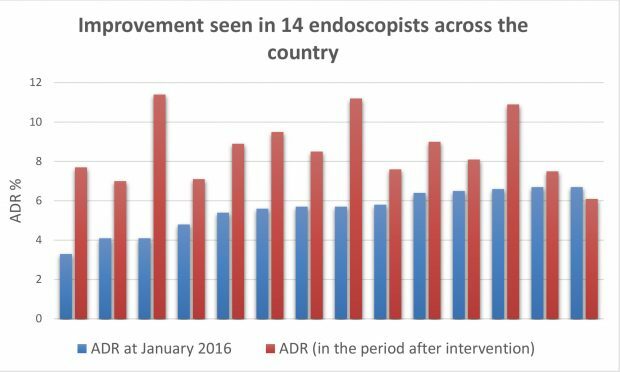 To continue this improvement, we expect screening centre clinical directors to monitor the ADR performance of bowel scope screening endoscopists regularly. SQAS will continue to support this process. Action plans should be agreed and submitted to SQAS for individuals whose ADR is below the minimum standard. These plans should detail the interventions to improve the clinician’s performance. Further support and advice is available by emailing SQAS at PHE.NationalQA@nhs.net. So does this mean you'd be looking for a detection rate of 6.8% overall? i.e. in 1000 people being screened you would be worried if there were fewer than 68 detected? So are you also saying that in order to estimate the rate and decide whether it is or is not close to 6.8% that the sample size has to be sufficient? What is the number on which a decision would be based? To do 1000 would take 350 hours at least assuming the clinician was doing nothing else (Addenbrookes' website suggests it takes 20 to 40 minutes to do a colonoscopy) so in order to see if detection had improved would take 10 solid weeks of work. Using the book "Sample size calculations for clinical studies" the exact numbers required to detect a real change can be calculated but it's going to need at least 1000 before and 1000 after the intervention. Thank you very much for the response to the recent blog on the issue of bowel scope screening adenoma detection rates and what we are doing to support struggling clinicians. The points and questions that you raise are valid and, please be assured, we are aware of the limitations of the data at this stage. The key point behind the work is to identify clinicians who may be struggling early on so that suitable interventions can be implemented to help them improve their ADR as soon as possible. This will help the programme to achieve its key goals. We will continue to monitor the change in performance in clinicians over a sustained period and hopefully report on this again in the future.